Just when we thought we had wrapped up our Emerald City Comicon 2015 coverage, we’re back with a little more. Here are a couple quick thoughts and photos from additional celebrity panels from the March 27-29 convention. If you’re in the Seattle area next April (the convention is expanding to four days in 2016), be sure to put Emerald City on your to-do list. 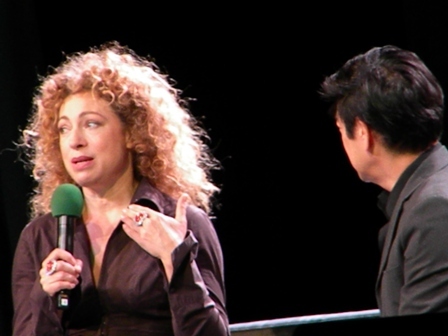 Speaking of Alex Kingston, she was on hand for her own panel. There wasn’t much discussion about her 160-episode run as Dr. Elizabeth Corday on ER, but of course plenty of people wanted stories about her recurring role as River Song on Doctor Who. Grant Imahara moderated Kingston’s panel. 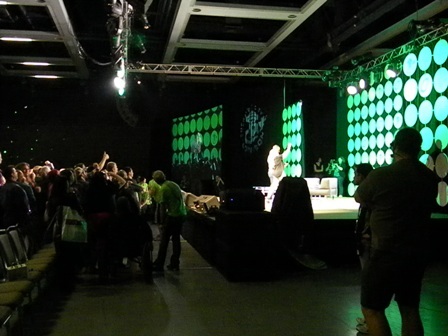 She seemed legitimately stunned by the number of attendees (a recurring theme this year, as many celebrity guests seemed truly unaware of how big a convention Emerald City has become). Imahara also shared the stage with the young man who portrays Derek Hale on MTV’s Teen Wolf, Tyler Hoechlin. There were some “ooohs” and gasps when a fan asked Hoechlin for some 7th Heaven stories. The actor, who played Martin Brewer on 62 episodes of the family favorite during 2003-07, basically demurred. Rather than touch the hot-potato issue of actor Stephen Collins (Rev. Camden on 7th Heaven), Hoechlin quickly said he had nothing but fond memories of working on the show before moving on to other topics. He spoke about feeling objectified on Teen Wolf, citing the gratuitous shirtless scenes he is routinely asked to play. Almost on cue, a pair of girls in the Q&A line asked him to flex his biceps. He was a good enough sport to give them just a taste of what they were after. 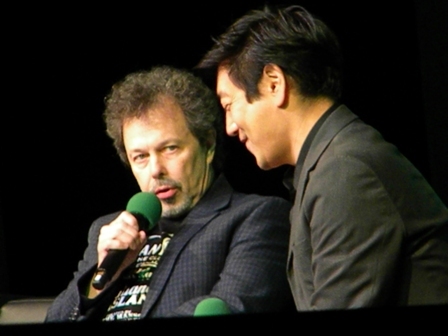 Curtis Armstrong (Booger in Revenge of the Nerds) talked about his recurring role as Metatron on the TV series Supernatural. The go-to question for anyone in the Q&A line who can’t really think of something to ask is, “Who are the biggest pranksters on set?” or some variation on that theme. Armstrong admitted that he doesn’t generally hang around long enough to know such things, preferring to fly in, shoot his scenes, and hop on a plane home. He also explained that he’d prefer to have a brief conversation when spotted by fans, as opposed to the more common approach in which people bellow out, “HEY, BOOGER!! !” from a distance. 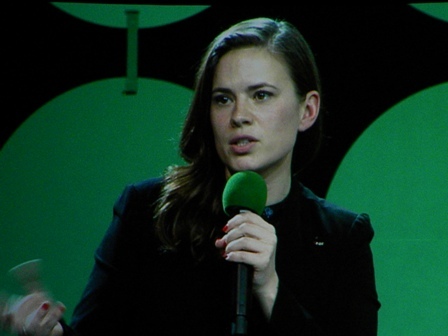 Hayley Atwell, Agent Peggy Carter herself, was the rock star of day one (March 27), answering questions about working within the Marvel Cinematic Universe before a jam-packed main hall audience. She shared an amusing anecdote about popping over during a break in shooting Agent Carter to get her driver’s license renewed at the DMV while still decked out in full costume. If you missed our earlier coverage, check out Part One (Anthony Daniels, C-3PO in Star Wars), Part Two (Stan Lee), Part Three (Clark Gregg and Chloe Bennet), Part Four (Anthony Mackie), Part Five (John Barrowman), Part Six (Marina Sirtis, Scott Wilson of The Walking Dead, Patrick Warburton), and Part Seven (Jewel Staite, Gina Torres, The Ladies of Buffy). We’ll leave you with a shot of one of Emerald City Comicon 2015’s closing moments, an onstage selfie taken by Anthony Mackie (Falcon in Captain America: The Winter Soldier and Avengers: Age of Ultron) with moderator Clare Kramer (Glory in season five of Buffy the Vampire Slayer).